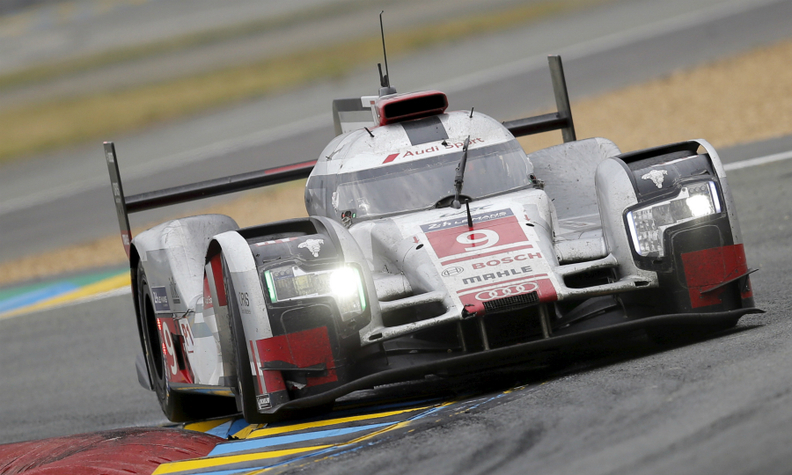 Audi has won 13 times at Le Mans in 18 years of racing. BERLIN -- Audi will end its involvement in the prestigious Le Mans sports car race next year after almost two decades to focus on racing electric cars, symbolizing a shift in strategy as parent company Volkswagen Group battles to recover from its diesel-emissions scandal. Audi, which is seeking to boost the share of zero-emission vehicles to at least a quarter of its global sales by 2025, said it will start competing next year in the Formula E electric-car racing championship. "We will conduct the race for the future on electric power," CEO Rupert Stadler told workers at Audi's sports car division on Wednesday, according to a statement from the company, citing the biggest transformation in the brand's history. "As our production cars are becoming increasingly electric, our motorsport cars, as Audi's technological spearheads, have to even more so," the CEO said. Stadler said Audi is taking up a factory-backed commitment in the all-electric Formula E racing series. Audi rival Mercedes said earlier this month that it might race in the Formula E 2018-2019 championship. BMW said a works Formula E involvement was "conceivable." Renault, PSA Group's DS brand and Jaguar take part in the championship. As it grapples with the costs of the emissions scandal, the carmaker is cutting spending to fund its shift to electric cars and autonomous driving, mirroring plans by parent VW. Audi denied a report in Germany's Handelsblatt newspaper that savings from pulling out of Le Mans and the World Endurance Championship would amount to an annual 300 million euros ($328 million). A source at Audi said the move would save Audi nearly 100 million euros per year. VW's flagship luxury division has set aside more than half a billion euros to cover costs for the diesel-emissions scandal and possible recalls of cars fitted with Takata airbags. Third-quarter financial results are due on Friday. Le Mans, one of the greatest tests of endurance for cars and drivers, has been a source of prestige for Audi which has won the race 13 times in 18 years. The decision to exit the WEC means Audi will be left with no diesel engines in motorsports, a spokesman said. More than a year after VW admitted to rigging emissions tests, Audi's move is another setback for diesel which analysts have said faces higher costs amid tougher standards and testing methods. But Audi said its exit from top-level sports-car racing does not imply diesel technology will disappear in its road cars. "If we are serious about achieving carbon dioxide emission targets, then there is no alternative to diesel because they are the most efficient engines," the spokesman said. VW stablemate Porsche, which has won Le Mans in the past two years with hybrid models, has no plans to quit, a spokesman said. Audi said it will continue to compete in Germany's DTM championship where it will switch from an 8-cylinder to a 4-cylinder gasoline-driven car in 2018. Separately, Audi is looking at the possibility of expanding its engagement in the so-called RX World Rallycross championship where it may replace its 4-cylinder gasoline model with an electric model, a spokesman said.